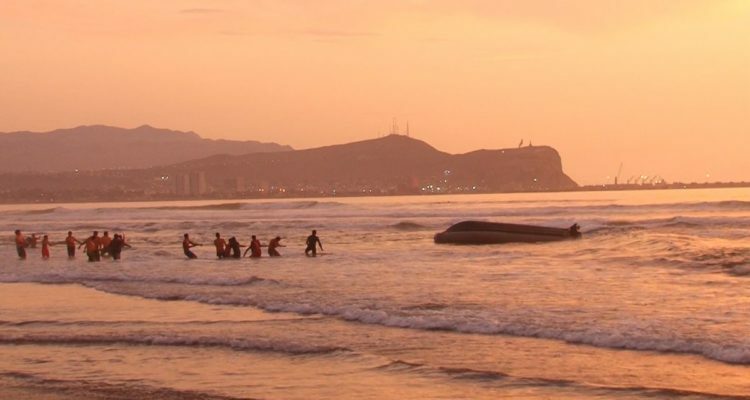 An emergency call to 137 originated an operation on the beach Las Manchas de Arica, which culminated with the sailors who came to the emergency being rescued by municipal lifeguards and bodyboarders after their boat was overturned by a wave train. The accident occurred around 7:00 pm this Saturday when, according to the head of the lifeguards, Juan Rojas, they saw the overturned boat from which they did not see the sailors leave for a time that they estimated in 15 minutes. It worried them, since they knew that “those boats have sliding doors and could be trapped”. “The bodyboarders managed to take them in the first instance. It was a team effort, “he said, highlighting the danger of the sector in which 150 rescues are already recorded during January, well above the 65 registered in December. According to reports from the Navy, they did not find the two bathers who would have made the original call, and it was during that search that they were overturned by the waves. They reiterated, therefore, the responsible use of 137 for emergency maritime calls.